Oh, the taxman. | Pulp and Circumstance, Juiced. With the impending doom of the taxman a-knockin’, the ever-brilliant Mike Rugel of the Delta Blues Museum has created a delicious “Sales Tax Blues” Uncensored History of the Blues podcast, featuring the likes of Mississippi Sheiks and Bo Carter, Ralph Willis, Harlem Hamfats, and Monkey Joe, to name a few. 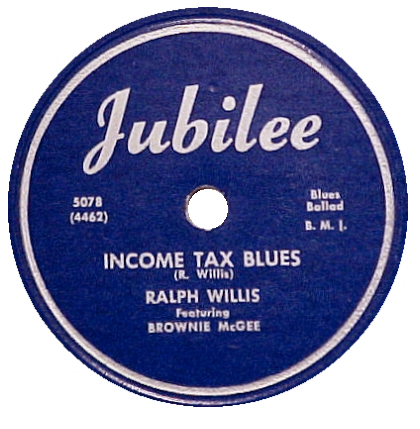 In response to the Great Depression, many states enacted regressive sales taxes in the hopes of redistributing wealth and encouraging growth; many a blues musician wrote tunes about the new taxes, including many a grandiose campaign in the mid to later 1030s which aimed to repeal such taxes. The podcast highlights some of the best of them; you can also read all about the sales taxes and the role blues musicians played in the brilliant Roosevelt’s Blues: African-American by Guido van Rijn, which is available to read online via Google Books. So enjoy a slice of some of my favorite blues artists, you won’t regret it. Enjoy. Hope you get a nice, fat tax credit, like meself!